"Togo is the Zembla of West Africa: If it did not exist," Matt Steinglass writes in Salon, "it would have been invented by the author of an absurdist experimental novel, prompting generations of unwary readers to leaf through their atlases in search of the place." The novel follows Koyaga's history through the Cold War years of Western-sponsored corruption, and into the '90s, when the old wrestler finds himself lost in a new world of IMF-mandated structural adjustment programs and exiles returning from Europe demanding transparency and decentralization. But its real genius is stylistic: The narrator, Bingo, is Koyaga's griot, a praise-singing storyteller who recites the leader's history over the course of a six-day, five-night banquet. The language, thick with African idiom and oral tradition, throws the postcolonial political narrative into high relief, like Woody Guthrie reciting the life and times of Richard Nixon. Sounds like excellent stuff. Read the publisher's description of Waiting for the Vote of the Wild Animals here. Tété-Michel Kpomassie ... grew up in a typical family of the Mina ethnicity in the 1940s and '50s, herding goats and picking coconuts on a coastal plantation. When a priestess of the local python god demanded that he be apprenticed to her, he fled the country, setting out for a far land he had become obsessed with since discovering a book about it in a missionary bookshop: Greenland. It took him eight years to work his way up through West Africa and Europe, but he made it, and spent two years living among the Inuit, driving a dog sled and hunting seal in a kayak. 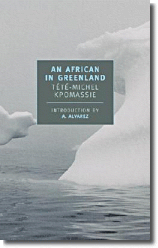 An African in Greenland, his 1981 account of those years, is one of the more original volumes of amateur anthropology ever written, as well as a ripping good travel yarn. And it's a curious meditation on Africa, Europe, the Arctic, and the tenuous and arbitrary ways in which different cultures regard each other as "savage." Read the publisher's description of An African in Greenland, along with some snippets of critical praise and an author bio, here. There are more inviting books--including "a more realistic introduction to Togo, ... the book beloved of every Peace Corps volunteer"--suggested in the article: click here to read it. Click here to read about Salon's literary guide to Brooklyn and here for its literary guide to Miami. Click here for a blog item about Wizard of the Crow by Kenya-born Ngugi wa'Thiong'o. Hazy about the location of the "Zembla" mentioned in the first line above? "Zembla" is derived from the Russian "zemlia," meaning "land." Zembla is the name of a "distant northern land" in Nabokov's novel Pale Fire. It is also the first--and maybe the last--stop on the web for all things Nabokov.